With Halloween coming up fast, there’s a lot to think about. What costumes to get, what candy to give out, what to make for the school Halloween party, etc. While there seems to be a lot of work involved in this holiday now that I’m an adult, I like to keep things fun and light for my two boys. This year I made them a special treat to wear for Halloween season with a cool new product from LunaTagz. I received two sets of reflective stickers from LunaTagz for review. One set of Skulls and one set of Teen Flame. These came at the perfect time of year. With the days getting shorter, and Halloween around the corner, these stickers made for a great quick project for me to give my boys. I bought two plain white t-shirts at my local craft store, washed and dried them, then simply applied the stickers to the shirts and “sealed” them with an iron (10 quick seconds as recommended by LunaTagz). I think they came out pretty awesome, and my boys love them! They give off a great glow in the dark and will be perfect for Halloween nighttime trick or treating. 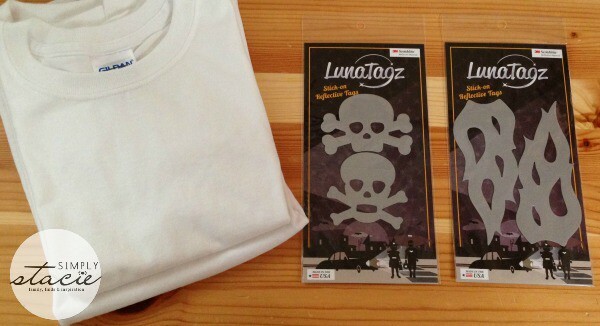 The Skulls and Teen Flame stickers sell for $4.99 a pack on the LunaTagz website. The great thing about LunaTagz is that they are made with a combo of genuine 3M Scotchlite reflective material and a specially formulated durable adhesive that make them perfect for use on running gear, bikes, helmets, clothing, backpacks, etc. They’re ideal for any activity that requires safety illumination from street lamps, headlights or any beam of light and when you’re wearing them you’ll be seen from up to 300 feet away! LunaTagz was conceived by New Jersey mother of three, Hala Assile, from her desire to keep her children safe and their desire to “look cool”. There are tags available for pet lovers, Halloween, sports and everyday. I like the Hat & Cat ones and the Lightning Bolts. I like the cat and the witches hat. My favorite is the skulls! I love the peace signs! I like the Teen Flame. I love the wristbands and the pet bands! I like the everyday pack 2! Of the Halloween ones I like the skulls the most! I love the lightening bolts and the Hearts, at my house.. I like the wristbands and the ghost and boo reflective stickers. I like the Lightning Bolts. Sorry…wrong post! 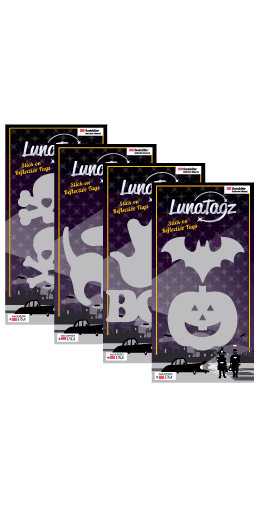 I like the Cat and Hat Luna Tagz set! I like the cat stick on reflective tags. i like the ghost one. I really like the Hat & Cat. I like the House & Bone Reflective Stickers. Too cute!! I could put them on my dogs winter coat. I like the pumpkin and bat out of the halloween ones, and the lightening bolts and hearts out of the every day ones. Good idea! I also like the cool Lightning Bolts!